Have you ever had a food attachment? What I mean is have you ever felt so happy with a flavor of a certain dish, or type of cuisine, that you would want it for your last meal, for your first meal, and for your “stranded on a desert island” meal? 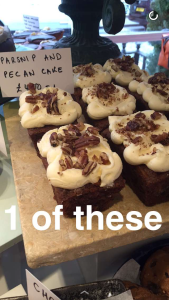 Well pretty much that sums up my feelings about anything that is made and served at Ottolenghi in London. This isn’t the first you’ve heard me go on about it. 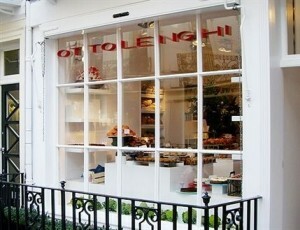 I included Ottolenghi (and two of their off shoot restaurants) on YDP’s “best of” short list for London . 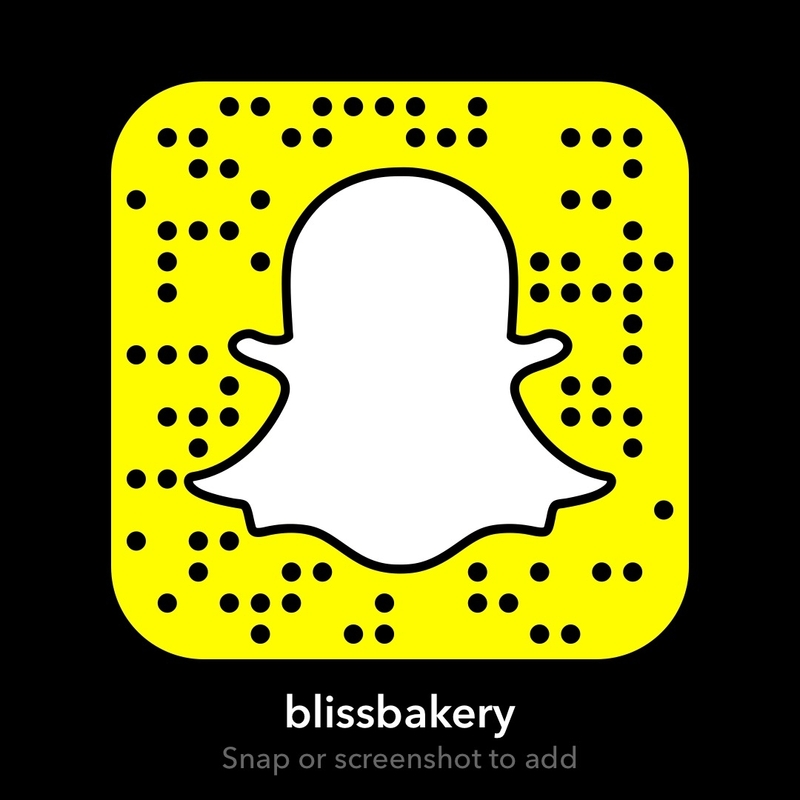 So for today’s Foodie Fieldtrip Friday, I thought why not bring along my snapchat friends (username: blissbakery) on a little tour of three of their outstanding food establishments. Because seeing photos and reading about it is one thing, but to get actual video too would be the next step before an “in person” visit. 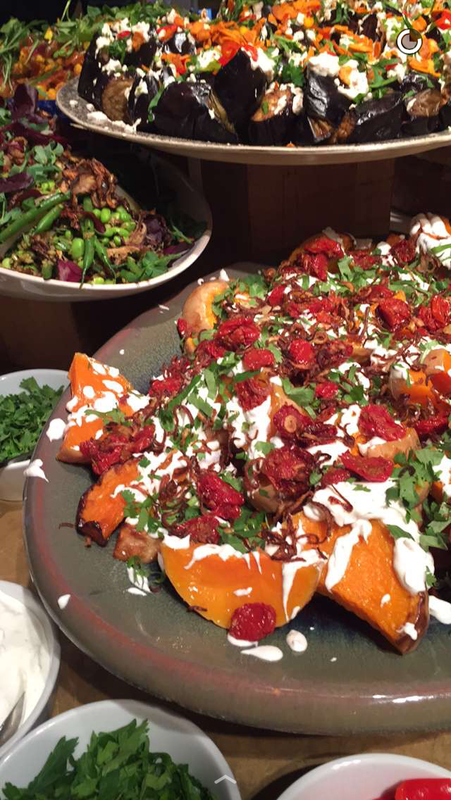 Can you tell I am trying to get all the folks in snapchat land to come over here for a giant Ottolenghi food festival!? Why am I so enamored you ask? Because food, in my opinion, is personal and emotional. 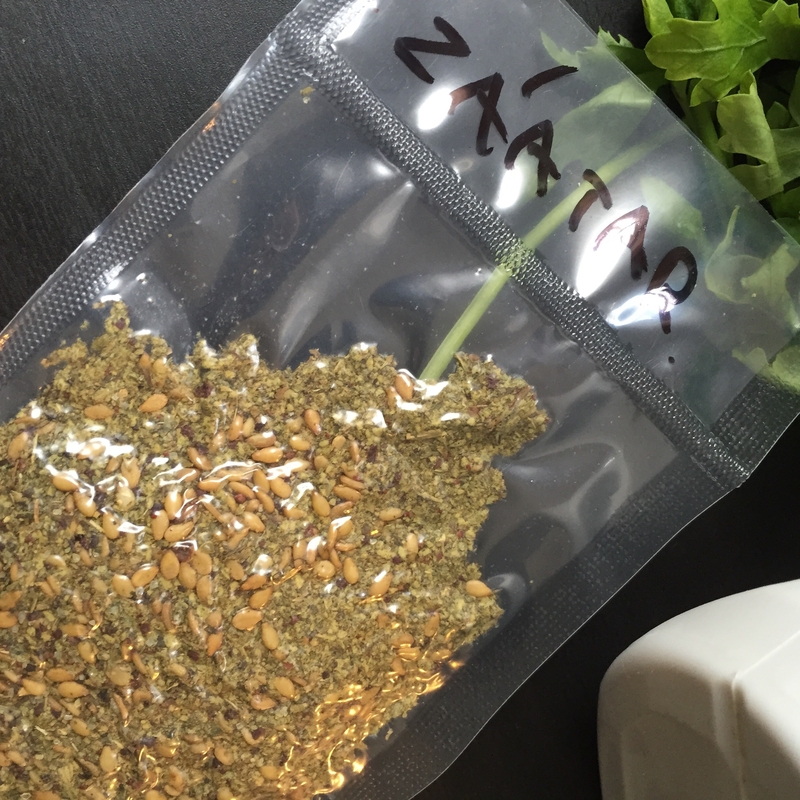 Sure most people would describe it as a nutritional substance, which it is, from a purely physical aspect. But food, and all that goes with it (the prepping, cooking, eating, etc.) can also evoke feelings. And when you eat food that has good “feelings” somehow it just tastes better. Alright, maybe for some it is a matter of how quickly they can skoff a burger before they meet up with their pals. But for foodies, like me, cooking or eating a meal is almost ritualistic in nature. I suspect that even people who put their hand to their mouth without ever thinking about the food that is going in, still get a happy twinge when they taste their granny’s special apple pie. Or they may even feel loved when they walk into their mom’s kitchen smelling all the aromas while she is cooking her famous Christmas dinner. And that my friends is the essence I get from anything I’ve tasted from Yotom Ottolenghi or Sami Tamimi. The upshot is, you can feel the love in their food. Sami is completely self trained as a chef, giving credit to his late mother for his food inspiration. Yotam is a professionally trained chef, having studied at Le Cordon Blue. But their reverence for quality ingredients, respect for classical cooking, yet embracing innovation and blending of unique flavors is what makes their food empire so special. 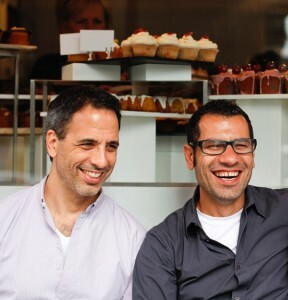 Though both originally from the Holy Land, they met and began their restaurant venture in London. When I met them last year at the Ballymaloe Lit Fest I asked how they have been able to bridge the proverbial political gap of an Israeli and a Palestinian working together to run a successful business? They said it probably wouldn’t have happened if they were still in Jerusalem. But they have written an ode to their motherland, a tour de force cookery book called Jerusalem. There have actually been several other books published along the way as well: Ottolenghi, Plenty, Plenty More and the latest is NOPI. So I decided to head to their restaurant NOPI in the Soho area of London for the first stop on the tour. I arrived at 11:30 and had a lovely poached egg and mushrooms on sourdough toast for a late breakfast. 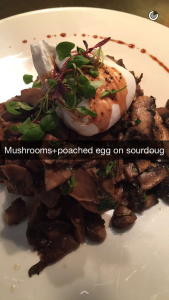 The mushrooms were beautiful, earthy and satisfying. And the poached egg was ethereal and perfectly cooked. The egg yolk made a nice runny design down the mound of mushrooms when I cut into it. Heaven on a plate! After a tour around the restaurant I met Angelo the head chef. 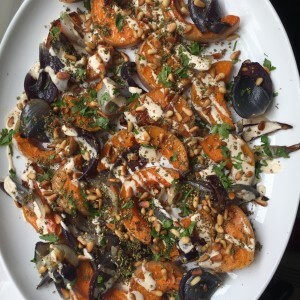 He kindly helped me with some Za’atar spices that I had been looking for in order to make the famous Ottolenghi Butternut Squash and Red Onion recipe (below). 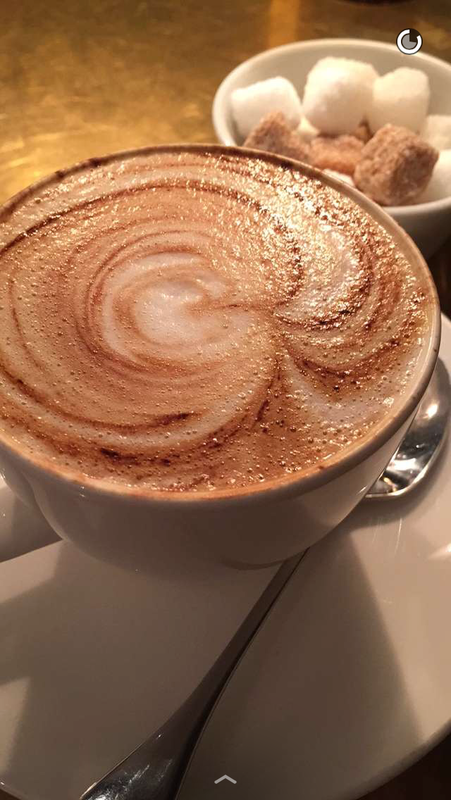 I enjoyed a lovely almond milk cappuccino made by Vytas, but I passed on having dessert (I needed to save room). 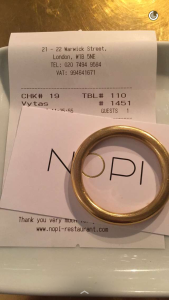 Sometimes it is the little things a restaurant does that is so impressive, like the brass ring on the plate with the check. Love that touch! I left to go to destination #2 but not before taking some snaps of the gorgeous platters of salad being set up on display for the lunch crowd. So vibrant! I toured around Chinatown on my way to Covent Garden to the baby of the Ottlenghi family called Sesame. It is a melting pot of Mediterranean street food flavors and is a great option to the unhealthy fast food that permeates Western society. I’ve been numerous times since they opened in April and love having something to eat that is quick, but also good for you! But when I arrived there I saw the place had been boarded up. 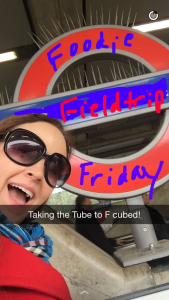 I was in a state of shock and disbelief. I called NOPI where I had just dined and asked what happened and they told me that it had just closed the day before. I was able to find a public notice through the Sesame twitter page. I got so emotional. Absolutely gutted! 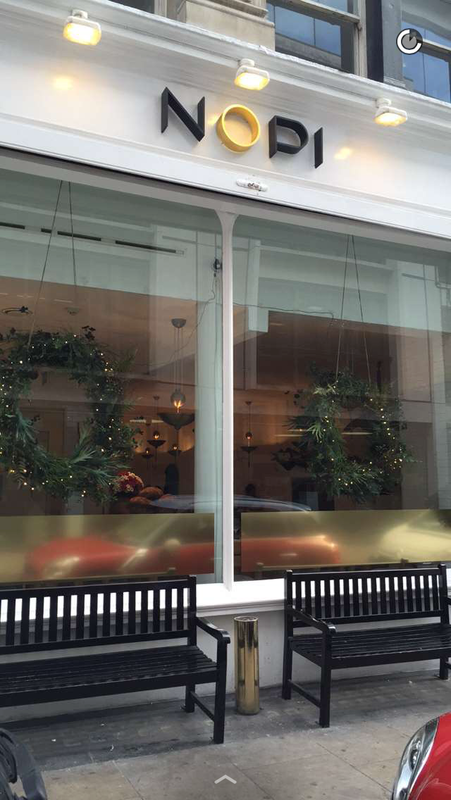 Then I happened to see people leaving Sesame through a side door and talked to them. They worked there and were in the process of packing things up. They shared their sadness as well, but also seemed optimistic. They said that Covent Garden turned out to be a challenging location for the type of fare they offered, and that they would reopen after the New Year somewhere else. God bless them! It just shows that even a company that is at the top of success in its industry can still face difficulties. The food business is a tough one, but the Ottolenghi brand is super strong and with the kind of positivity they have, they will weather this little blip. I can hardly wait for them to reopen in their new location! Wherever it may be, I’ll find them and be the first customer! 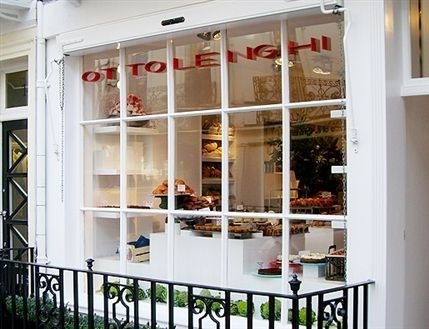 Next I traveled to the Belgravia location of the classic Ottolenghi deli and my spirits were lifted, as well as my taste buds. Remember, I didn’t have dessert at NOPI and I have a massive sweet tooth. So I helped myself to a yummy taster of flourless chocolate cookies. And then I proceeded to buy the whole shop (nearly) getting all sorts of Christmas gifts and some food for dinner. I bought lovely veggie focaccia bread pizza and a broccoli salad (with a kick) for Hubby and my dinner and movie night at home! Then of course I had to get an amazing coconut macaroon and beautiful parsnip and pecan cake for afters. Though the shop is quite small, it is packed with goodness. 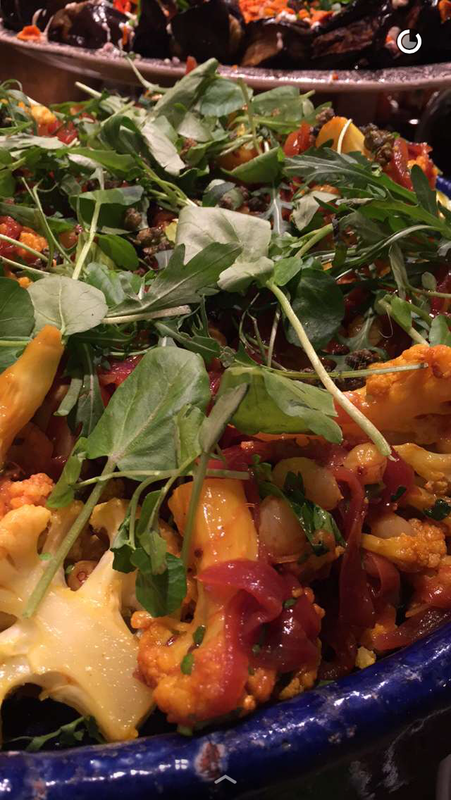 The colors of the salads piled high on crisp white platters is overwhelming. 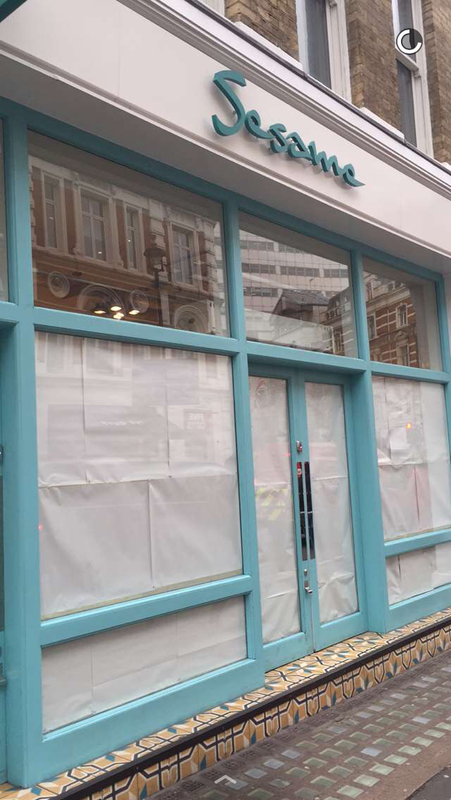 And the front window is bursting with the most incredible looking treats such as giant meringues and mini fruit tarts. 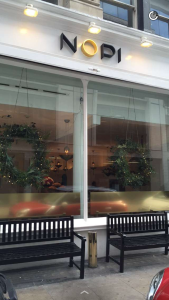 There are also deli locations in Notting Hill, Islington, and a sit down restaurant in Spitalfields. 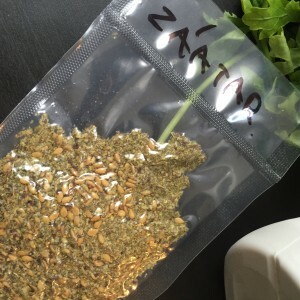 If you can’t find Za’atar in your local store, it is available to purchase online through Ottolenghi’s website by clicking the next link. This is my result folks! 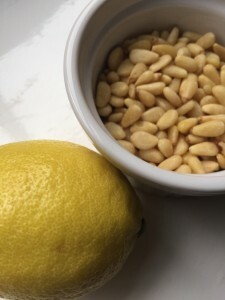 The dish is so simple to make yet the depth of flavors and textures is incredible. It is light and also filling at the same time. The colors are eye popping and look great on a platter to be served family style. Each and every element of this dish is well thought out to add its own distinctive flavor and texture, yet coming together as one. And the Za’atar is the “spicing on the cake” love it! It was quite cathartic to make this dish as I was feeling very emotional about what happened to Sesame. 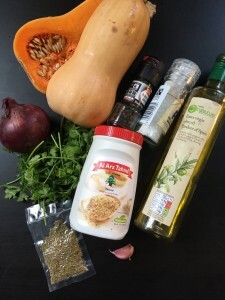 But I have such admiration for them and they have really inspired me and my cooking. I just want the best for them and wish them even more success to come. 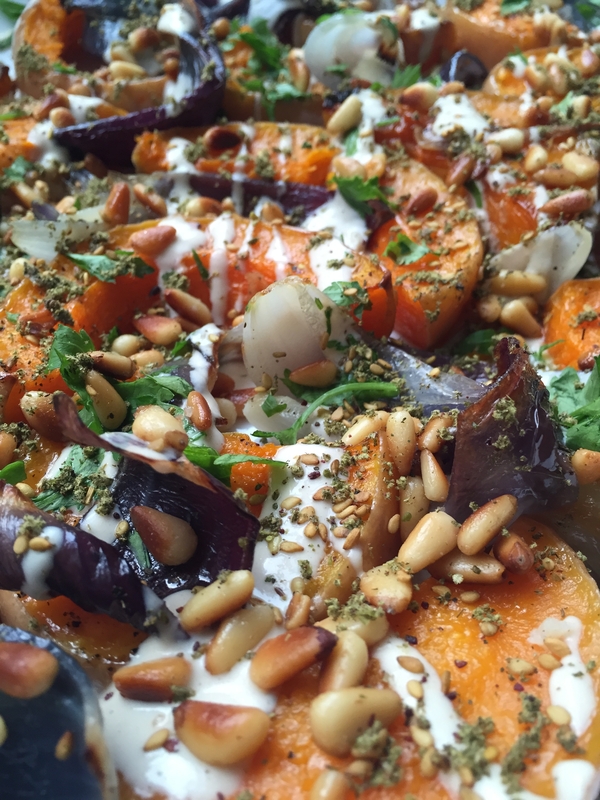 The cool thing is Sami usually refers to the “Ottolenghi family” in his social media posts. Because there really are so many vital people involved, he wants to share the credit of the success of the business, which is so lovely and humble. 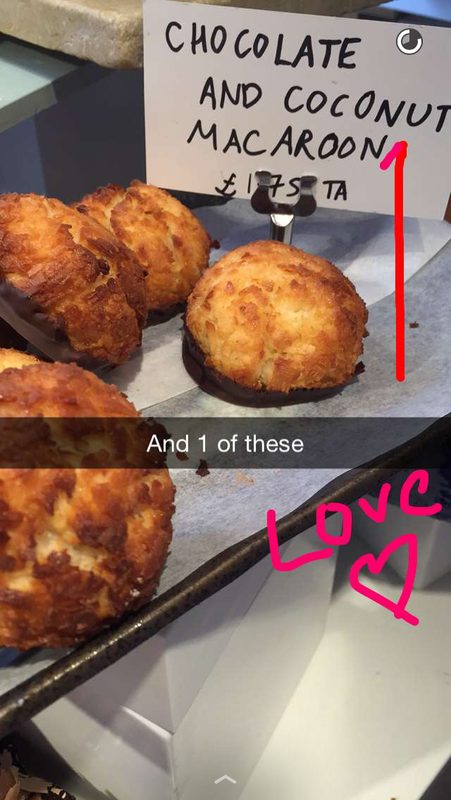 I really hope that if you ever come to London that you will visit one of their restaurants or delis. 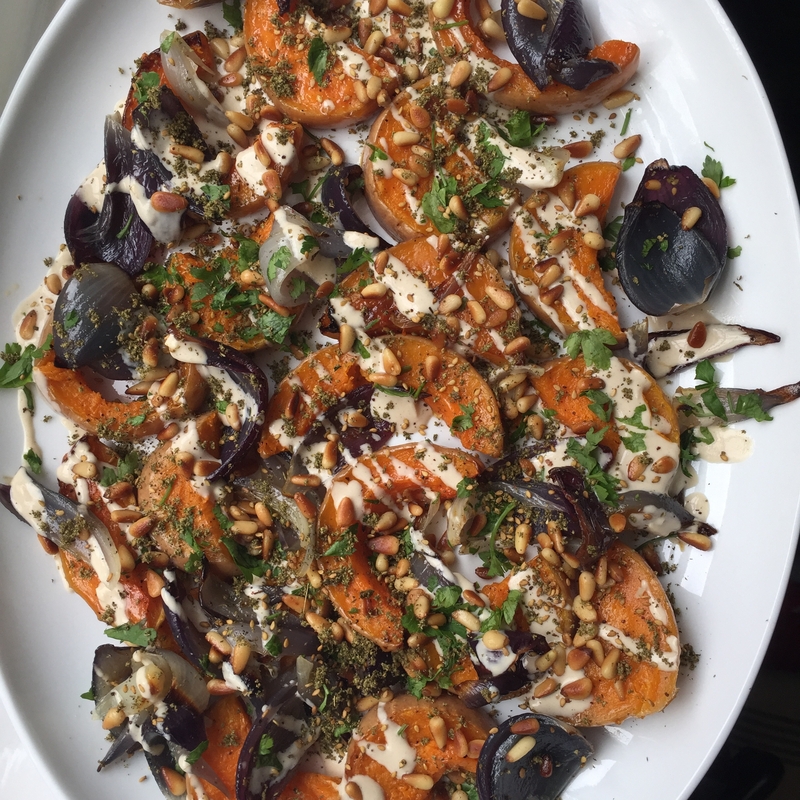 And if you can’t make it this far, bring Ottolenghi style to your world by trying out one of their fabulous and healthy recipes. You really will feel the LOVE! P.S. as I have stated before in the ABC of YDP I am not a food photographer or stylist. So apologies to Ottolenghi and Co. as I know your dishes look much better than I have been able to recreate here. 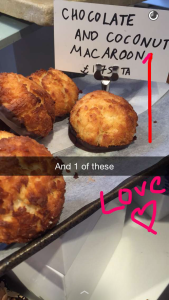 But they still tasted amazing!